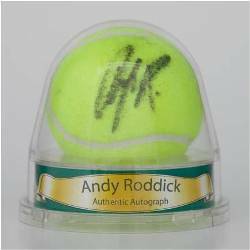 Combining tennis cards and memorabilia, the big draw of 2011 Ace Authentic Hidden Signature Series IV Tennis is the autographed ball that comes with each box. Just about all the biggest names in the sport from the past 20 years are present, as well as a handful of rare celebrity-signed balls. 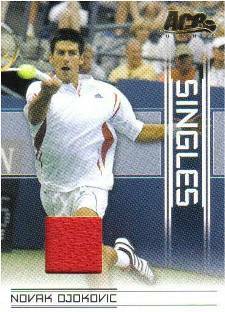 Each box also comes with seven packs of cards and one memorabilia card. The product is limited to 60 20-box cases. Every box includes an autographed tennis ball. 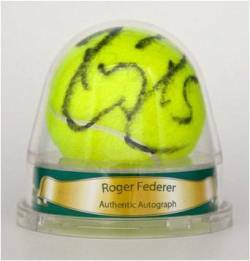 Highlights of the autograph checklist include Roger Federer, Maria Sharapova, Andre Agassi, Pete Sampras, Venus Williams, Serena Williams, Rafael Nadal, Martina Hingis and many other top names in the sport. Two dual signature balls inserted in every case. Some of the signing combination include Sampras and Agassi, the Williams sisters and Federer and Nadal. Celebrity autographed balls fall at a rate of 1.5 per case (or three celebrity balls in every two cases). Celebrity autograph signers include Charlize Theron, Elton John, Diego Maradona, Will Ferrell and Wayne Gretzky. Each box has one memorabilia card. Additional autographs randomly inserted in card packs. Limited print run of 60 20-box cases.